Title: NS 8934 & 9058 down to about 10 mph. Description: Approaching the station with her warning bell. Title: " Lets get ready to rumble"
Description: A final walk around before leaving the units for the next gang. Description: The other two unts to your left never came out to play. 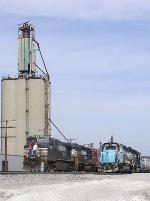 The closer of the two is NS 9333. Description: 38G whips past Milepost 32 with the last light disappearing, today behind dissapointing power. Description: Running the opposite main behind 213 at 1:42PM. Description: Eastbound on track two at CP Burn with a trio of widecabs following the 36Q.